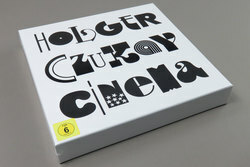 Holger Czukay - Cinema. Vinyl LP, CD. Bleep. We can’t think of a better tribute to the late Can co-founder and renowned tape splicing expert Holger Czukay than this special boxset. Gronland pool together tracks from a wide array of Czukay related projects, with ambient pieces from Cluster & Eno sitting next to art rock classics from Les Vampyrettes and solo masterpieces such as ‘Boat Woman Song’. Jah Wobble, Conny Plank and even Japanese singer Phew all appear across the five records on offer here whilst the 36 page booklet and special DVD make this a must buy for serious fanatics. Great way to commemorate one of the best!